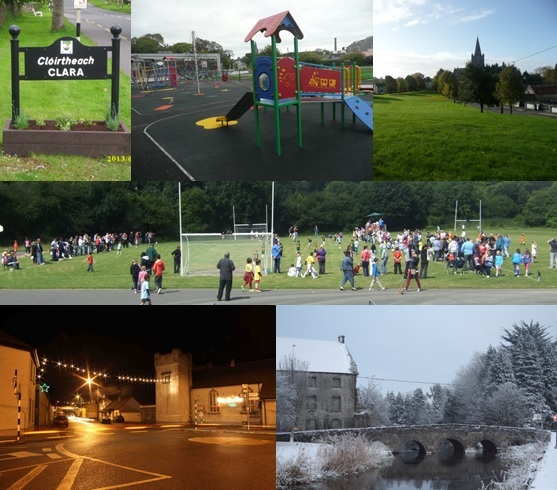 Welcome to the Clara Community Website, which is a convenient and useful source of up to date information about the town of Clara and its surrounding area. You will see as you browse through the pages that, for a small town, Clara has a lot to offer and its people are rightly proud of their town. It has a vibrant community spirit with rich and diverse natural habitats. The range of resources and activities available make Clara Town a great place to live, work and visit. Lying at the very centre of Ireland, halfway between Dublin and Galway, Clara makes a central base from which to explore the country. Thank you for taking the time to visit our site and we hope you find the information interesting and helpful. Perhaps you would like to comment, suggest an idea or make a contribution to the site, please contact Clara Family Resource Centre 057 9331928.